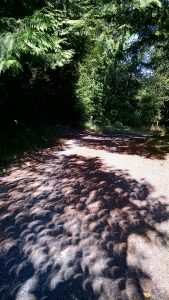 Partial eclipse viewable via pinhole camera effect of the trees. Most of the time I spent dashing between the house (with KPTV’s live newscast—oh no! Fog has descended on Lincoln City!) and the outside. What surprised me was that it got eerie. I expected the birds to stop chirping, but the change in sunlight quality surprised me. As the moon eclipsed the sun and started blocking the light, the sunlight seemed to turn almost blue, like a grey filter was getting applied to the world. Then the temperature quickly dropped and I had to run inside to grab a fleece jacket and wool socks. No wonder one could think the world was coming to an end! And then before I knew it***, the eclipse was over and the sunlight got warmer, the birds returned, and it was time to see about lunch. If I can only remember where I filed the eclipse glasses . . .
*”Watch” via eclipse glasses, a welding helmet, a cereal box pinhole camera, and natural pinhole cameras through the trees. Not all at one time. **Probably with a stronger drink, though. ***Seriously. It was all of maybe one minute. ****That didn’t come out right. I meant more of a “the moon completely covers the sun and there is absolutely no sunlight” full-on TSEE.